Since their first performance on the Western Shore of the Chesapeake Bay in 2008, the West Shore Piano Trio has brought passion, color, and penetrating insight to the works they perform, not only through their playing but also through their commentary and interaction with audiences. Praised for their “fluid” and “sultry” playing, the West Shore Piano Trio brings new life to the monuments of the trio literature. Highlights from recent seasons include the premier of Ruby Fulton’s trio “Whitney” which was commissioned by the WSPT and premiered at Community College of Baltimore County Essex Community College in Baltimore, MD; collaborative performances with DancEthos at Washington DC's Fringe Festival; a concert and masterclass at Endicott College in Beverly, MA; travels to New Mexico to collaborate with violist Willy Sucre for performances in Placitas and Socorro; and a performance on the FUMC Vesper Concert Series in Lubbock, TX. 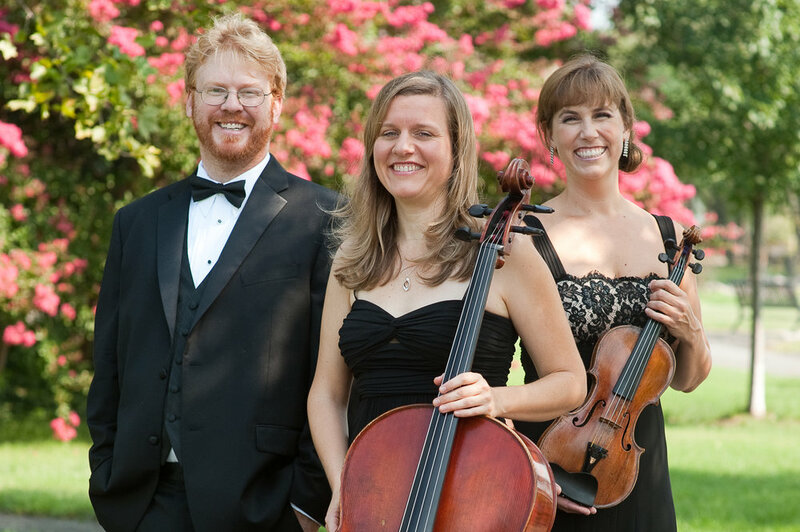 Past concerts have taken the West Shore Trio from coast to coast and they have performed in Alabama, California, Maryland, Massachusetts, New Mexico, New York, Pennsylvania, Texas, Virginia, Washington, D.C. and West Virginia. Performances include concerts at the Smithsonian American Art Museum, the Chautauqua Institution, Intersections Festival, An die Musik, the Duke Ellington School of the Arts, Goucher College, St. Mary’s College of Maryland, Harmony Hall, and the Washington County Museum of Fine Arts. The WSPT believes that education and live performance enhance each other, and that the better informed an audience is about a work, the more deeply they will appreciate its performance. To this end, the members of the trio accompany each concert with brief verbal commentary, providing biographical details about the composer, framing the work in the context of its time, and highlighting thematic and compositional elements of the piece, as well as connections shared between each work on the program. When speaking about the music, they use accessible, jargon-free language that enables the music to be understood by non-musicians and musicians alike. The West Shore Trio’s commitment to education further extends to include masterclasses, question-and-answer sessions, and collaborative projects. They maintain an active relationship with the Duke Ellington School for the Arts, where they have given multiple concerts, coached students from the orchestra, and served as mentors for students in the string and piano divisions.They also maintain ongoing connections with Frostburg State University and Goucher College, where they have given concerts, spoken to students about the logistics and lifestyle of a career in music, and given a lecture/performance on the political and personal elements of Shostakovich’s piano trio. While traveling they have visited local schools or colleges and have given concerts and worked with students at Endicott College in Massachusetts and at the Stephen Wise Academy in California. Based in the Washington D.C. metropolitan area, the members of the trio were educated at the Eastman School of Music, New England Conservatory, San Francisco Conservatory, Rice University Shepherd School of Music, the University of Illinois, and the University of Maryland. They have studied with or been coached by such esteemed musicians as violinists Lynn Blakeslee, Isaac Stern, Kathleen Winkler, Roland and AlmitaVamos, and ZviZeitlin, pianists Larissa Dedova and Brian Ganz, cellists Bonnie Hampton and Brandon Vamos, and members of the Aborada, Alexander, American, Cleveland, Concord, Juilliard, Kocian, Kronos, Left Bank, Miami, Miró, Pacifica, Penderecki, St. Lawrence, Tákacs, Tokyo, and Ying Quartets.